"To leave your mark on a brand, you have to put your guts into it," said Jean-Pierre Ploue, PSA design director. BARCELONA -- Its been a tough five months since Jean-Pierre Ploue took over as the first director of styling at PSA/Peugeot-Citroen. The auto industry slump is taking its toll on new-project development, which is complicating Ploues plans for consolidating and improving design at the two French brands. PSA CEO Christian Streiff has asked Ploue to give Peugeot the same design flair hes credited with bringing to Citroen over his eight-year tenure. Ploue, 40, spoke with Automotive News Europe Staff Reporter Lawrence J. Speer about the challenges of his new role during the press launch of the new Citroen C3 Picasso here. Youve stepped into this new role at a difficult time. Its true that the market is tough for everyone, but the crisis has probably also allowed me to gradually build up speed. Weve had to postpone some projects and adapted others to the new situation. This is actually giving us a bit more breathing room, and more time to reflect on where we should be going with the reorganization of design for the two brands. You were previously the head of styling at Citroen. 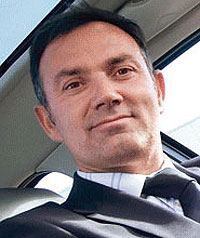 Jerome Gallix used to hold a similar post at Peugeot. Are there any plans to have separate Peugeot and Citroen design bosses again? We would prefer not to go down that road today. And its not just a question of cost, although there is an element of that. Ive been asked to do the sort of work with Peugeot that I did at Citroen. For my artistic direction to be clear from the beginning, then I have to be the one doing the job there. So what is the goal at Peugeot? And how do you put the Jean-Pierre Ploue stamp on the brand? To leave your mark on a brand, you have to put your guts into it, as well as your philosophy and your emotions. At Citroen, I developed a strategy for product quality and perceived quality while developing the character and values that helped the brand evolve toward its own idea of modernity. Now I have to do the same work for Peugeot, but its absolutely different, because the brand is different. It has its own history, its own approach. Its probably not going to be easy, but its not going to be difficult or impossible either. Must you change Peugeots design? Theres definitely a Peugeot style, which is well recognized and has its fans. We have to reinvent this style, like you would with any other brand. Were going to add modernity, through the use of technology, while maintaining the French elegance that Peugeot is known for. A Peugeot has to have personality, it has to move you when it drives by.